Did you know... we carry over 1000 bolts of fine cottons? Perfect for every aspect of sewing, whether you are a quilter, budding fashion designer or make designer bags, we're bound to have a fabric that suits your project to a "T". From hand dyed to imported Danish cottons, from prints to organic solids (pictured to the left - just one of the walls floor to ceiling of fabric we carry! ), you'll find something for everyone! The next time you're at Sewing Arts picking up fabrics for the perfect quilt or sewing project, ask for a Fringed Benefits card. 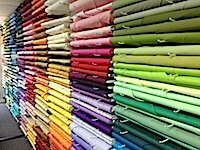 It's worth one free yard of fabric with the purchase of one yard or more of fabric each month for the next 12 months. Thank you for the opportunity to earn your business, and for your support of Sewing Arts! We look forward to seeing you.